Most herbs taste much better fresh, and rosemary is no exception. That’s why every winter I try to keep my rosemary alive in a pot inside the house. Rosemary is not reliably hardy north of zone 7, so while southerners can grow this in the ground and watch it take on shrub-like proportions, we cold climate gardeners must bring it into our houses and attempt to give it the equivalent of a southern winter indoors, or it will never really get big enough to harvest from regularly. It’s not easy, let me tell you. 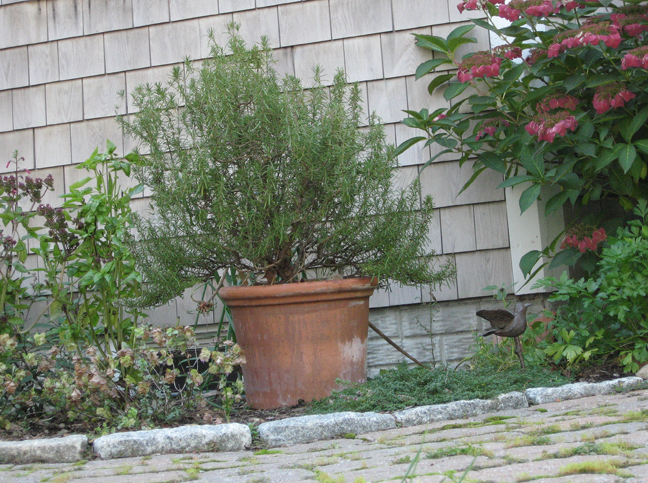 More than one northern gardener has finished the winter with a dead rosemary plant. To succeed with any plant, a gardener thinks about its native range and tries to approximate those conditions. 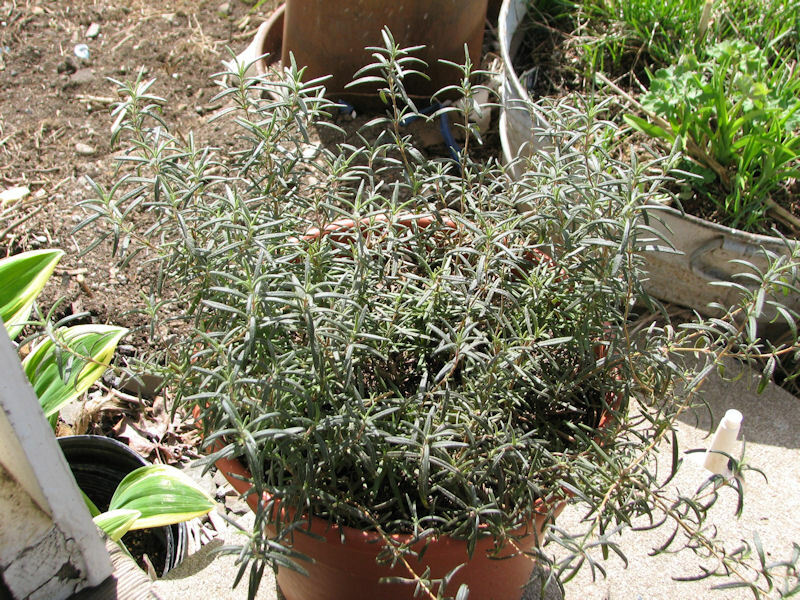 Rosemary is native to the Mediterranean basin. This is where many people make their first mistake. They hear that rosemary is drought-tolerant, and they let it dry out. But as Nancy Szerlag, Detroit News gardening columnist states, “a dry rosemary is a dead rosemary.” What people forget is that the Mediterranean climate receives almost all its yearly precipitation during the winter. The rosemary wintering over on a windowsill still expects it to rain. That same Mediterranean native thinks winter is significantly cooler than the typical furnace-heated northern residence. Judy Miller, owner of Paradise Gardens Rare Plant Nursery and occasional contributor to this website, says, “I either keep it on a barely heated sunporch so it doesn’t go below freezing or above 50, or against the coldest window in a cold room.” No habitable room in my house stays below 50F in the winter, but some rooms are definitely cooler than others. Those are the rooms I consider for the rosemary. This 8 year old 'Salem' rosemary is over 3 feet tall and wide. It spends each winter indoors. Photo by C.L. Fornari. This frost damaged rosemary gives you an idea of how large my rosemary had gotten after two years. Unfortunately, all the leaves dropped and one whole section of the plant never came back after it was subjected to a late spring freeze. I don’t know what variety my rosemary is. It was just a generic rosemary plant, rescued from the herb section of a big box store. My rosemary also puts out this weak growth, and I give it a good haircut once it is acclimated to the great outdoors again. That is, it gets a good trim when I don’t nearly kill it leaving it outside in the spring. There seems to always be one spring morning that gets a lot colder than I expect, and I have pulled this rosemary through the winter at least twice, only to almost lose it to a late spring frost. 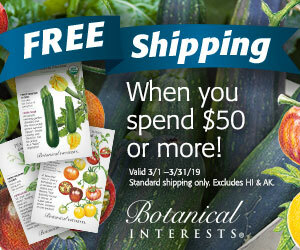 You can find rosemary in the spring almost anyplace that sells vegetable seedlings. However, if you want to get a specific cultivar, such as ‘Salem,’ you will probably have to order through the mail. Papa Geno’s Herb Farm has an extensive selection of rosemary varieties, including ‘Salem.’ I’ve never tried them myself, so if you have experience with them or have your own favorite source to recommend, please tell us all in the comments. I have decided to give my green thumb a try for the first time this year. I wanted to start everything from seeds inside, and tried to choose a handful of easy things to start with. Little did I know, Rosemary is not the easiest to grow. In case it helps, I live in I think zone 8, in St Paul Minnesota. I planted on March 5th this year, and only one little seed sprouted. Over the last month, it has slowly but surely grown, little by little. I think they are called “true leaves”, when the actual plant starts growing from between those first two cute little leaves that come up? Well, once the “true leaves” started to stick up, the whole seedling has started to lean, and look a little wilty. I gave all of my plants so far (rosemary, thyme, tomatoes) a little dose of water based fertilizer after so many weeks of growth, which I read on a website. Anyhoo, I am wondering if anyone knows why my rosemary would be wilty and leaning, looking like it could possibly be dying. And if so, is there any way to save my little seedling I have waiting so long for to grow?? I am pretty clueless as far as if I should water it more, let it dry out a bit? When I stick my finger in the potting soil, its damp/wet, but nothing like soggy or muddy. Also, I have my seedlings in starter pots that I want to say are maybe 5-7 inches tall, and maybe 4-5 inches across. They are in my spare bedroom that stays around 65-70 degrees, and I have a plant light that I keep on for anywhere between 12-14 hrs a day, with a small fan going on medium speed during the day also. Any help or suggestions would be much appreciated! My rosemary thanks you as well. I am no rosemary expert, but I think there is a reason (or maybe several reasons) why most people grow rosemary from cuttings, not seed. It may be seed starting is difficult, or it may be that the flavor varies greatly from plant to plant and taking cuttings is a way to guarantee good flavor. So, if your seedling dies, please don’t consider it cheating to buy a rosemary plant. I think your seedling could stand to be a little drier. I try not to water my established plant until it is dry when I stick my finger into the soil one knuckle deep. If it is still damp at that depth, I don’t water. If your seedling is already rotting, about the only thing you can do is withhold water and hope for the best. When it is a nice day, put it outside for about an hour. In general it sounds like your setup is good, but if you are truly is Minnesota there is no way you are in hardiness zone 8. All gardeners learn by trying and seeing what works. We all kill plants as we find out what doesn’t work. So please don’t think that you’re not a good gardener if something dies. 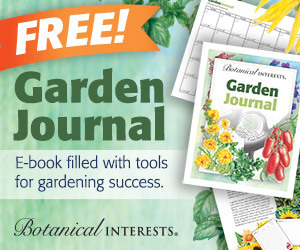 You are gaining experience that will help you be a better gardener in the future. So grateful to find this post and it’s many interesting comments still up. I had beginner’s luck with a wonderful rosemary plant years ago and we were rather sad when it didn’t make it through it’s 3rd winter. I just dug this year’s out of the garden and thanks to the info here, I have it on an unheated enclosed porch with some south sun…and I will make sure it doesn’t dry out! I put a thermometer out there and will monitor the temp. If I can keep it going til late March/April I will be happy! I do use it occasionally in cooking but I love it’s scent most of all! Thanks for the wintering over in the house tips. I live in central Mass. I have 2 Rosemary plants that I overwinter in the cellarway bulkhead of my Condo in NW Ohio. This cellarway goes to my basement doorway from out of doors & is unheated. I place the plants here after the weather has turned towards 40 degrees. The plants remain here throughout the Winter without heat or light & I don’t water them until they’re brought back outside the following Spring. The plants look a little rough in the Spring, but they soon recover & put on new growth once in the light & water/nourishment is applied. The larger of the two is of prostrate nature, but I have trained it into an upright conical shape. It is presently nearly 4 feet tall. The smaller of the 2 is of an upright growth nature & is about 2 feet tall. This is a simple way of bringing a Rosemary plant through the Winter. I suspect that an unheated garage space would suffice just as well. I live in central Ohio and have had luck leaving mine in the garage (uneheated) near a sunny window. I usually water once or twice over the winter and then bring it back out to the garden in the spring. It is so nice to be able to cook with fresh rosemary over the winter. As described by “thermanicgardener” I experimented with a few plants of rosemary to let them hibernate in the garden bed. I covered the plants with heavy mulch and covered the mulch with a washingtonia palm leaves in late November. In March the mulch was temporarily lifted to peep inside. It was pleasing to see the rosemary living and green as if in hibernation. I have covered the plants again to save them from the vagaries of a possible March snow and low temperatures. A.R. Wadoo, where do you live? What part of the country, and what zone? I am wondering where you get washingtonia palm leaves. That does not sound like a plant that grows in a cold climate garden. Is it a houseplant? Or do you live in a warmer zone and are just messing with our heads? I will try and bring mine in next year and see if I can keep it alive, since our climate is the same and winter definitely does it in. Thanks for the info. I hope all is well and your winter is not dragging yet. These past few “warmer” days have been great. Imagine when it’s 40 degrees outside, I will probably have to break out the bikini and get a tan.oooh that’s scary, maybe not. Maybe a long walk instead. I started Rosemary only this summer.The plants were about three months old when i transplanted a few into an earthen pot to over winter in a store rom. The plants look healthy at present. thanks for the info regarding watering the plants .I did water the plants but lightly,now I will give them a libral dose of water. I let my rosemary dry out over the winter… I wasn’t diligent in my waterings :(. I cut it back; there was still some wick in the larger stems. Any chance it could come back? If I can’t get this plant to come back, I will try your suggestions on a new one. Thanks! I managed to overwinter a great rosemary plant last year, but come spring it became infested with mealybug (must have been in the soil). I put it in a sunny window that has a storm window on it, so sunny, but not TOO sunny and watered it once a week. It was potbound, so I think it was pretty darned dry by the time I watered again. That reminds me, Lois, it’s time to water mine! I must admit that I gave up on rosemary many years ago and have been buying it in bulk to defray the cost. This is the first year in many that I actually bought a rosemary plant. Here in zone 5 I’ve had it in the house on the south facing window sill just waiting for it to die. Sadly 😉 but truly. Then I had an idea. I bought a heat bulb and brooder light determined to have a little corner garden in the kitchen. I’ll let you know how it goes. Over the years, I have had some rosemary plants make it, and some, not. I have discovered that if I keep the plants from totally drying, then they are more likely to survive. In the next few days, I plan to write more about my experiences with rosemary in my blog. I overwintered a bay plant that was about 14 inches high in my east facing garden window last year, and we did not harden it off before putting it outside, and put it in too much sun, so some of the leaves got burned. We put it in a more protected spot, and it ended up growing a few inches. Now, it barely fits on the inside edge of the window. I don’t know what we’ll do next year. It’s also one that doesn’t seem to like to get too dry in my house. A couple of years ago I tried to bring in rosemary and it lasted maybe a month. This fall I have decided to try it again. Since the killing frosts started about a month ago, the rosemary has been inside most of that time. I do put it out on the deck when it is rainy and warm(ish) overnight. So far the weather has cooperated and I have been able to put it out once a week. So far it has stayed healthy, but who knows what will happen when it has to be inside full time. Maybe I got lucky and got a cultivar that can stand the indoors better than the last one I tried! Very timely post, I am bringing my plant indoors this weekend. I hope it survives. On a separate but related topic. Any good hints for a bay tree? I gave up on this herb as I always end up killing it. I think it is time to try again. Thanks for this info. Every winter I bring in a potted rosemary plant and by Christmas, it is usually dead. Now I know after reading your post, that it requires regular watering. I often find that my rosemary gets infested with spider mites … I’m hoping to be more diligent and ensure that doesn’t happen this winter. JTM and others, I am pretty sure the cold is more important, as long as the rosemary gets some light. Lack of light will make it leggy but it will survive. I rarely get bloom on mine. I think it needs to be cooler and brighter to bloom than what I keep it at. Kate, I personally couldn’t take a house that was rarely above 60 in the winter! I don’t think a rosemary ever goes completely dormant, and it thinks the growing season should start back up again much sooner than it really does around here, so you will always get some premature growth. I’m definitely guilty of letting my rosemary dry out too much in past overwintering attempts. I will try again (for the 3rd or 4th time!) and this time I’ll water more generously. Well, like Jane-Marie, now I know why my rosemary’s been doing what it’s been doing, but I was luckier than she, so mine’s still alive, and heading into its second winter. I just stick it in front of a south-facing window where some sunlight, at least, manages to fight its way through the spruce trees. Our house is rarely above sixty, but I did notice new growth last winter; now I’m wondering if I should put it where it’s even colder, so it can do the plant equivalent of hibernating. We have 2 very large (for Wisconsin any way)rosemaries, each is maybe 2 1/2 feet tall and wide. I leave them out in fall until late October or early November. Then I wheel them into the basement with a hand cart and put them under a flourescent light. The basement is cool and I keep the light on for only 10 hours to try and keep them dormant. They do usually start to grow in late winter, and that growth is killed off when they go back outside in spring. I move them to a north facing porch in late April, then out to sunshine by mid May. They’ve been in the same pots for maybe five years now and I can’t move them to a larger pot. So last spring I root pruned them and gave them some fresh soil and I’ll probably do that every year now. BTW Rosemary flowers taste GREAT – sweet and tangy at the same time. I’m in zone 4 and my rosemary seems to like it inside better than out! I keep it in a south facing window with a radiator below (though my thermostat is only set to 64 at the highest and drops down 10 degrees at night) and I water it every few days when I remember. I don’t know the varieties I have…one plant has a much smaller leaf and is blooming much of the winter. The others has a thicker leaf and hasn’t bloomed so far. I do keep the new growth pinched back as there’s nothing better on a cold day than roasted potatoes and onions with garlic and rosemary. Well, this is useful; no wonder mine died! I don’t know if I’ll try again; I have my hands full with my indoor or overwintering ornamentals. Good advice, Kathy! I’ve only done it with one plant, but keeping the pot in a south-facing window, pressed against the cool glass, kept that plant alive but growing at a very slow rate through 10 winters. Then we moved to Texas, it went into a hypertufa container and lives outside. Good luck to all you northern Rosemary lovers! Thank you for this helpful info. I’ve tried wintering over rosemary before and not made it much past February. Reading through the tips you provided, I’m sure I let it dry out to much. The other problem I think I have it that I can give it the cold window or the bright light. I can’t really do both. Which do you think is more important? I have tried to keep rosemary several times and failed miserably each time. Now I know why. Thanks for the tips. Oh, dear. I’m in California and my chief concern is keeping my Border Collie from peeing on the rosemary, which, unfortunately, is growing next to a walkway he traverses daily. “Don’t pee on my rosemary!” has been heard throughout this neighborhood on numerous occasions, I assure you. It’s definitely a bush and one of my favorite plants. It lends itself to baked potatoes and breads and soups and chicken. I rely on it a lot and am very grateful for its presence in our lives. You are brave back there in the cold! The only one I can keep alive is about 7 years old – a prostrate form that I got at a garden center. It is on a window sill over my kitchen sink – one of the warmer spots in my house. I am afraid to put in outside in the summer for more than a few days at a time for fear it will die like all the ones I have grown outdoors and then brought inside. I have no idea why this one prospers, but I am glad it does. Good info on overwinter Rosemary. I’ve never even tried, but maybe I will now. My wife, the herbalist, keeps rosemary indoors till March. She says it never lasts indoors much longer than that for her. We’re in zone 5. As for its culinary benefits, I only like it in turkey dressing. I just keep trying to over winter it here in my zone 6 garden. It is ‘Hill Hardy’ rosemary, but it doesn’t really work. Someday I ought to plant one in a pot so I can at least try to keep it alive. Thanks for the info. I have a rosemary I’m planning on trying to winter over. HM, now I have to decide where to put it.